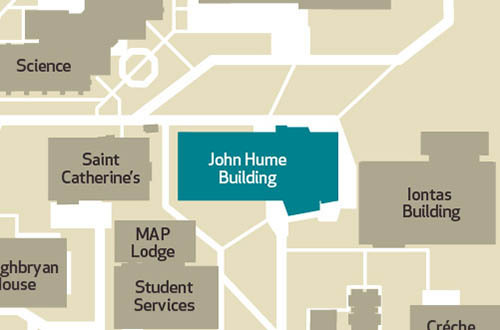 The Graduate Studies Office is located on the 3rd floor of the John Hume Building on the North Campus. Our team is dedicated to supporting you through your postgraduate studies, from application to graduation. Cuireann an Oifig Staidéir Iarchéime comhairle agus tacaíocht ar fáil do mhic léinn maidir le gach gné de staidéar iarchéime. Má theastaíonn eolas uait maidir leis na cúrsaí, na scoláireachtaí agus na seirbhísí a chuirimid ar fáil, tá fáilte romhat cuairt a thabhairt ar an suíomh gréasáin do staidéar iarchéime. Tá ár bhfoireann tiomanta tacaíocht a thabhairt duit tríd do staidéar iarchéime, ó iarratas a dhéanamh go lá bronnta na gcéimeanna. Supporting research students with subject specific and transferable professional skills.